Just read an extraordinary book - "What the Dog Saw and other adventures"
- Malcom Gladwell's bestseller, and thought writing a book review about this because - even is his style was absolutely new and so different to me - I really enjoyed his short novels enclosed in this book and made me wonder and think over so many life aspects and human attitude, characters, mind and limits, in a daily challenge to survive, adapt, evolve and eventually succeed. Have you read this book, too? Have you read any of Malcolm Gladwell's books before or are you accustomed with his journalistic style? Are you also a book lover thrilled to read any new release shown on libraries and book stores? To me, Malcolm Gladwell's book "What the Dog Saw and other adventures" is one of the most amazing gathering of contemporary short novels describing so well people's inner desires and struggle to achieve things, and their unique paths and incredible ideas for pursuing their dreams. And author Malcolm Gladwell's easy way of presenting various mundane aspects from his characters life combined with an unique descriptive writing talent, are captivating reader from first page of each new story, triggering your curiosity and thirst to read more and more. 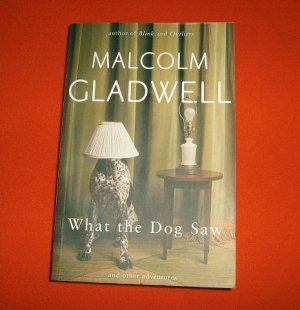 Read Malcolm Gladwell's bestseller What the Dog Saw and you may have the chance to change your perception over various things in life! 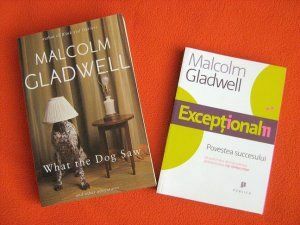 My perception about Malcolm Gladwell and his book - "What the dog saw"
I like books, mostly good literature, and I do love reading, that special and so rare feeling... of new silent discoveries. And to me nothing compares with the real pleasure of staying relaxed into your home, rewarding yourself with a ‘break time” from all daily activities dedicating few hours for reading while listening to some bits o f good – eventually classical – music. British born Canadian journalist Malcolm Gladwell literary style is far from being as fluent and friendly as his predecessors, being more close to his professional background, journalism, but after first 2-3 pages, the reading becomes more friendly and you feel like watching a very well structured and prepared documentary, showing the evolution of his described characters in a blunt funny realistic way… and all these will make you be willing and anxious to read next page and next page to find out the end of the story and its conclusion. And you’ll be amazed with the realistic life stories! - Part three – “Personality, Character, and Intelligence” and 6 more stories. A lot of simple stories that got metamorphosed along the way due to various circumstances, ups and downs, and plenty of ideas that changed the whole life of his characters. - Connecting to dots – The paradoxes of intelligence. Malcolm Gladwell - The best line ever - "It was like driving down an interstate looking through a soda straw." The "Observer" quote about the author - "Malcolm Gladwell is a global phenomenon... there is, it seems, no subject over which he cannot scatter some magic dust." Win Borden quote - "If you wait to do everything until you're sure it's right, you'll probably never do much of anything."